The Thermo Jewett -30 Undercounter Freezer is high performance, compact, and built for industrial use. This undercounter freezer has extra strength, hermetically sealed refrigeration compressors, and high density CFC free insulation for great temperature retention, and uniformity. The directed air flow of this undercounter lab freezer helps recover temperatures quickly after an opening. 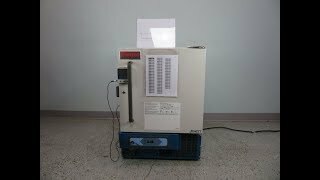 The temperature range of this laboratory freezer is preset at -30°C and can be controlled from the brightly lit, microprocessor controlled display. Alarms, both visual and audible, can also be programmed from the front facing display, and locked with the three-position keyed master switch. The Thermo Jewett -30 Undercounter Freezer is built with easy to maintain, smooth interiors that resist scratching to last a lifetime and comes with a 1” insulated access port for instrumentation. The door for this undercounter freezer has a smooth full length door handle, a positive seal, and is self-closing with a hold when opened to 90°, and a keyed lock for added security. This laboratory freezer also comes with an automatic defrost for optimum cooling. Third Party Digital Thermometer Seen in Pictures is not included. This Thermo Jewett -30 Undercounter Freezer has been thoroughly inspected and is performing to expectations. All of our lab equipment is backed by our standard warranty. Should you have any questions, please don't hesitate to contact us.